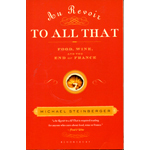 Here’s a New Year’s Resolution for 2012 that I intend to keep: Read some wine books. Make it at least six. Pull together a specific list—and make it public (tah-dah! )—to guarantee success. Unlike wine magazines, which focus on new releases (Wine Spectator, for instance, has some tempting book choices in the current Dec. 31 issue), my list is a motley collection of old and newish books. That’s because I simply raided my own bookshelves, pulling down long-ignored volumes that have been gathering dust over the years, despite my best intentions. So, here’s my selection for 2012. French wine is in crisis; French bistros are disappearing; Macdonald’s is doing gangbusters in France. What happened!? Slate’s wine columnist hits the road to find out what’s behind France’s ennui and ask, Is there any hope? Back in 2008 at a tasting at Chambers Street Wines, I happened to meet Camuto, who was doing a book signing for Corkscrewed. I bought the book, but it sat on my shelf, untouched, for years. Recently I read his latest book, Palmeto, and found this a thoroughly enjoyable portrait of Sicily’s new generation of winemakers. So now I’m motivated to go back to Corkscrewed, the author’s tour of France’s neo-peasant winegrowers. Sanders, a Maine-based writer, spent two years among winemakers in France’s rural Cahors region—eating, drinking, talking, listening and generally absorbing the wine culture there. Malbec is at center stage, and it looks like some good writing is too. I’ve started this book twice, then got sidetracked by work. But this time I’m determined to read uninterrupted Taber’s lively account of the California vs. France taste-off in 1976, now the stuff of legend. A former Time reporter, Taber was the only journalist there on the scene. He's got the inside view and the reporting chops—a good combo. 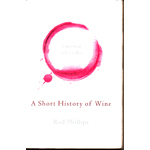 I’ve dipped in and out of this book when researching various pieces of wine history for my articles and wine tours—reading how the Romans cut their wine with spices and salt water; tracing what civilization was the very first to vinify grapes. Now I intend to plow through all 365 pages (not so short, despite the title). Dense, but interesting reading by a professor of history at Carleton Univerisity, Ottawa. As a tour guide, I would never write about our clients. But Dario Castagno did. My husband enjoyed his wicked descriptions of Americans on tour in Chianti—a new breed of Ugly American searching for a fantasy Tuscany. 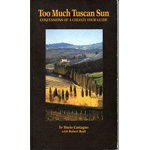 Since Castagno’s book is displayed by cash registers in wine shops all around Tuscany, it’s been on my “should read” list for some time. This compendium is fat—607 pages—but it’s just the thing I should read now that I’m thinking of spending a week or two in Umbria this year. Kerper has gathered interviews and essays from writers ranging from Erica Jong to Gourmet travel editor William Sertl to food writer Faith Willinger. “It’s like having your own savvy personal tour guide,” says the book cover. I’ll put that to the test this year. This was one of my haphazard finds on the ELLE giveaway table, where I freelance copyedit. While I like Malbec, I was more inspired to grab the book because I’d recently met the smart and vivacious Laura Catena, whose father was the key player in the rise of Argentine wine and whose family figures prominently in this book.